Mile 0 - 20 | Taking it easy & taking it all in. A chorus of alarms went off at 5am, why we all decided we needed to set one I don’t know. There was a nervous buzz in the room as we tried to pack our bags the way we had practiced, stuffing things into every nook and cranny as systematically as possible. This will get easier won’t it? Scout and Frodo fed us a hearty breakfast before gathering us on the deck and splitting us into volunteer cars to shuttle us to the southern terminus, I felt calm but I could feel a lump forming in my throat - this is really happening! The drive was longer than expected but I was thankful as it gave me time to quieten my racing mind. I kept going over my kit list, did I have everything? Have I packed too much food? Is my sleeping bag warm enough? 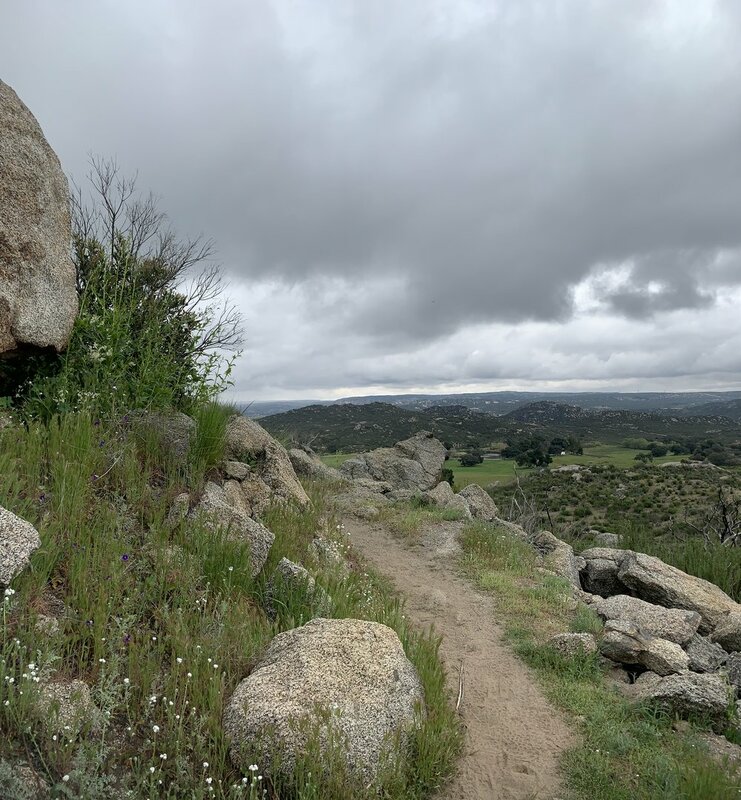 The 5th was very overcast, we mourned the lack of blue sky in our terminus photos for a hot minute before realising that it was the perfect hiking weather, especially for 3 brits and an Irish. We hung back as everyone had their photos taken, we had already decided to take it easy and do a cool 7/8 miles so there was no rush what’s so ever! After more than enough photos it wasn’t certain if we were dawdling to not get to camp before lunch or if we were too nervous to actually start! I had always thought that the trail was straight off from the terminus and wondered how hikers before me had managed to take photos without other hikers in the distance, turns out the trail is back down a hill and heads off along the road we just drove down. All the many times I’d pictured it in my head it was immediately baron desert but we were walking by a road, near houses with boarder patrol trucks zipping past! Everything was so exciting and new, the flowers were so small, the land was so green! We could smell the different flowers and leaves, it was a sensory overload and we hadn’t even started climbing up into the mountains we could see ahead of us! 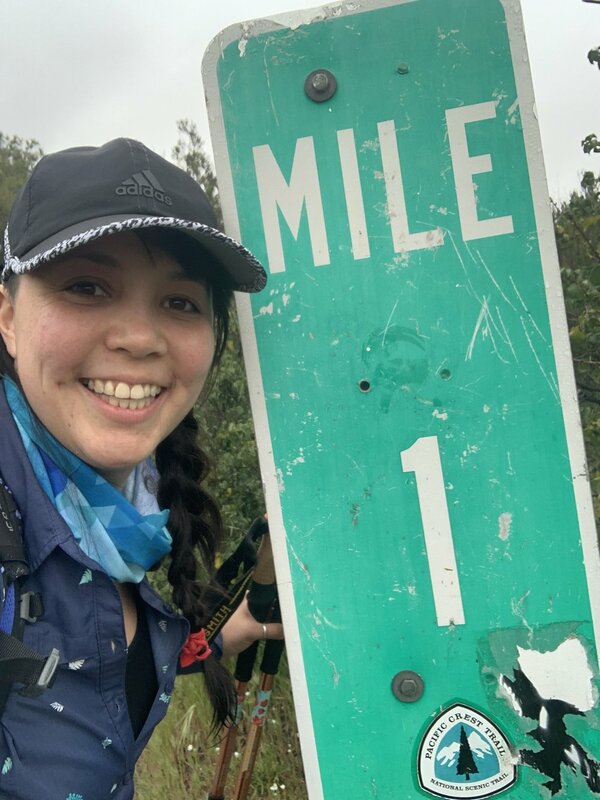 We took all the classic photos with the mile 1 sign and the rail tracks. Slowly the trail started to pick up as we climbed up and into the mountains, Claire set the pace for us at a slow shuffle and we took breaks to appreciate new flowers and our first stream. We got to camp by lunchtime despite our best efforts to go slowly. So far the trail has been very easy to follow and the Guthook app we use to navigate had elevation, water sources, tent sites and waymarkers both on a map and in a list with all the mileages listed. You can create a log on and add comments based on how you found the campsites or if water sources are still flowing, it is a quick and fairly reliable way of planning the few miles ahead and when to stop for water. The weather dipped again towards the evening and because we stopped hiking at lunch we got cold quite quickly, it was also drizzling on and off so we dived into bed early with promises to be up and about by 7am. I slept well cocooned in my tent and sleeping bag, it rained on and off through the night but that added to the atmosphere. 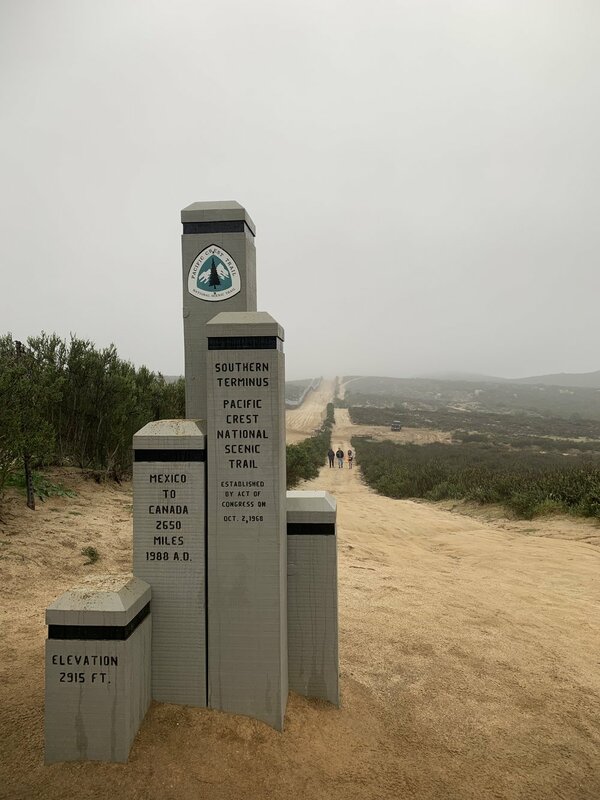 I felt refreshed and calm, all the blogs and posts i’d read in the lead up had played their part but now it was my turn to truly experience the PCT. We were very slow getting out of camp, it felt like we’d forgotten how to pack our bags! The overnight oats we’d all sat and made the night before were inspected and discussed, some successful some very not. My concoction was powdered coconut milk, chocolate protein powder and a sachet of instant oats - I would NOT recommend it. I kept getting chunks of protein powder that hadn’t mixed in, the consistency was thick and paste like. Yuck! Once we got going it was stunning! There were barely any clouds in the sky and the mountains went on for miles! We knew there was going to be a big drop in elevation to a water source called Houser Creek before a big climb back up to Lake Morena where there was an official camp ground with toilets (Yay!) and a Malt shop with milkshakes! One of my favourite things so far on the trail is being able to spot the trail snaking round the mountains ahead of us, trying to guess what it will be like and where on earth a lake is suddenly going to appear from! Because we were so late out of camp it got hot quickly. We slapped on the sun cream and dumped electrolytes into our drinks. I’ve always thought the second day of hiking is always stronger than the first and was happy to find it was still the case, imagine how strong i’m going to feel in a month, 2 months!! We started our descent down to Houser Creek on a big dirt road, a forest ranger stopped us and asked if we had fire permits and our PCT permits but never checked them. He gave us a leave no trace talk and let us on our way! Down and down we trundled before the terrain changed to trees and grass, we all collapsed into the shade by the water which was steadily flowing across the path. The PCT has a funny way of making you feel like the only one around for miles until you get to a water source and suddenly the hikers come out from the woodworks. It ended up being a very sociable lunch with people we’d been leap frogging over the last day and new faces. The talk was all focussed on the big climb into Lake Morena and to do or not to do. A Scottish guy named Smokey Bear who we’d met previously at Scout and Frodo’s promised us the burgers, chips and milkshakes were worth the climb - we didn’t need a whole lot of convincing! Tuna melt and side salad! Worth it!